Jill was a great-great-great-great-granddaughter of Robert Dumville (c1767-1857), molecatcher of Hunton, Yorkshire. She carried out many years of research into the Dumville family, before the days of the Internet, and published it on this website. Written by Jill and published in 'She' magazine, August 1967. I belong to that race of mysterious beings which holds such a privileged position in society today. I'm a teenager. But mini-skirts, drugs, protest marches - the most controversial subjects linked with my fellow-teenagers - and even the far more deserving, but less publicized young people's ventures - Community Service, VSO, and kibbutz work, for example - most of these concerns are not, and cannot be, part of my life. Twisted, deformed legs call for skirts of a discreet length, and I swallow quite enough drugs already without any foolish idea of taking those which so often hit the headlines. If I really wanted to join a protest march I could, I suppose - if some kind soul were willing to push me along in a wheelchair. In short, the main requirement for the vast majority of activities involving the young, social or anti-social, is "sound physical health". I now generally manage to look healthy enough - for that I am intensely grateful - but for the past ten years or so the answer to the question "Sound physical health?" has always been a painful "No". Rheumatism and arthritis are generally regarded as the curse of the old; few people realize, especially where the chronic forms are concerned, just how many young people suffer from them. The problems - physical and psychological - are great for all groups, but perhaps even greater for the young, who have a whole life ahead of them to adjust to. There are the very young children; those entering, or in, adolescence; there is the young housewife; the successful young businessman - all with the life ahead of them tragically and irrationally removed from the sphere of "normality" to that of "abnormality" when they find they have fallen victim to one of the arthritic diseases. Some may be almost completely crippled: some may, with help, lead a restricted but relatively mobile life; a small lucky minority may break free from the disease altogether. There are said to be 50 or more types of rheumatism, of which the main crippling ones are rheumatoid arthritis and osteo-arthritis. Most of us are hit by rheumatism some time, somewhere. Far too often, however, reference is made to statistics alone - to the wastage of work-hours involved - with no reference at all to the human problems and suffering of the individual. I have had rheumatoid arthritis since the age of about ten. Its onset was subtle and very gradual. In some people the appearance of the disease follows an attack of rheumatic fever; it is sometimes said that it may follow a period of great stress. For myself, I can recall no unusual circumstances of the period when I first became aware that something was wrong. At first the only sign was a great fatigue and aching after vigorous activity, but gradually I found that I was growing clumsy and "heavy-footed". I could not do dainty Scottish dancing; I had difficulty in raising my heels off the ground. In PE exercises I was not nearly as flexible as my class-mates. Knees easily bent, their crouching position meant that their heads were not very far above the ground; mine remained conspicuously towering 18 inches or so above theirs. My family was living in the tropics at the time, in East Africa. Unfortunately there were few doctors, and those had an acquaintance with only a limited assortment of diseases. The doctor I was taken to diagnosed flat feet and gave me some foot exercises to do. I also had to wear some specially-made, very heavy lace-up shoes, which I hated, and which seemed to do much more harm than good. Soon I began to experience the hurtful psychological effect of the disease. My school introduced netball into the curriculum, and I was not able to take any part in it. So, for the first time in my life, I had to sit back while others worked to gain praise and recognition. In an unthinking moment, I tried to assert myself. I boasted to the chosen netball captain that if I had played I would have been made captain. She laughed, and turned away. In school and out I had been a shining light in an endless variety of activities. My life had been one really lived to the full. Then came the disease. My personality was to change completely within the first year. The extrovert - and nobody could have been more of one - became almost a complete introvert, a clam living in a world outside "normality". The process of mental inversion was not helped by the very disruptive effect of of our departure for England just before my eleventh birthday, although this move was to mean great benefits in the treatment of my disease - ultimately, if not immediately. On reaching London we determined to seek further advice about my condition. We consulted a branch of a famous foot-specialist, and to our great surprise were told that my feet were far from flat - instead the arches were too high! I was given special supports to try to remedy this condition, and more exercises to do. I made no improvement. A month later we went to a doctor, and at last he found what was really wrong with me - rheumatoid arthritis. It was a great relief to know what my disease really was - even though the accompanying news was dismaying: that the cause is unknown, and there is no recognized cure for it. However, treatment commenced. All physical activities were forbidden me and complete rest was ordered, which meant that I was not allowed to attend my new school for the first half of the first term. When, after half-term, I eventually did go to school, I found that friendships between the new girls had already been forged, and I was an odd one out, even more so since I was unable to take part in PE or games of any sort. The process of introversion was accelerated. Adolescence is usually a difficult period for any child, and even more so for one who has to learn not only to develop his child's mind to that of an adult, but also to reconcile his or her personal "abnormality" with the world of "normality". The process of making something constructive, not destructive, out of one's disability requires long perseverance in learning and great skill; it is a difficult task at any time of life, without the added complications of adolescence. The hurt caused by disablement can so easily become an excuse for hurting other people and for making them targets for jealousy and bitterness and desire for revenge. Disease damages not only joints and tissues; it can damage the mind. Often physical exertion or some other activity demanding a healthy constitution can help to ease the frustrations of the adolescent. This escape-valve was not open to me. But I was lucky in having intelligence and a liking for reading, learning, and painting; so that I was able to alleviate my frustrations and, at the same time, while others were looking for success elsewhere, to seek success in these fields, with rewarding results. Even so, I minded bitterly my apartness and disability and, despite the other outlets I had, I confess I sometimes could not help succumbing to being nasty to other people. I had not yet learned to live with the minding. That has taken a very long time, and the journey towards it has been arduous and fraught with difficulties - and sometimes seemed not worth taking. An understanding and loving family has greatly helped, though, and I have been fortunate in that mental improvement has gone hand-in-hand with physical improvement - although the pace of the latter has been a good deal slower. On the way one has to come to terms with many things. Perhaps one of the most frustrating is the hopelessness of explaining one's condition to those who can never understand. A few are able to; for many others even a glimmer of comprehension is impossible. There are the problems of everyday life to tackle, the coming-to-grips with the fact that one may often have no more capacity to do something than a wooden doll. Those with healthy hands little realize just how important a part the hand plays in life. Arthritic hands lose their ability to grip. Beating the mixture by hand for a cake, typewriting, holding an umbrella - these become almost, or totally, impossible tasks. Trivial molehills can easily build up into mountains. I used to be very scared of travelling on buses - fearful that the bell would ring and the bus move off before I had hoisted myself on to or off the platform. The problem is not such a frequent one now, thank goodness, but I still have a real reason for my fears if I happen to have done more walking than my legs will painlessly take. I have to ask someone's help in putting on stockings, or make use of a special apparatus. For the past few years I have been unable to reach my feet; I use a long-handled bath-brush to give them a good scrub. But one becomes intensely grateful for the things one can do, and pleasure at being able to do something becomes real and very deeply felt. It has a value which is missing when such trivialities are taken for granted. The most important stage in my adolescent journey towards learning to live with the minding has been the point at which the full, accepting, comprehending realization came, that everyone to one degree or another has problems of the "private world" and that it is possible and it does bring some ease to oneself to share one's difficulties with someone else who has the capacity to understand. There has been, moreover, the comprehension that fellow arthritics suffer not only the same physical problems, but often the same psychological ones. I was especially helped in this comprehension when I read the wonderful book Private World of Pain, by Grace Stuart, who first became aware that she had rheumatoid arthritis when she was 19. Her clear-sighted gift of being able to understand her own and others' difficulties is a source of great comfort. Grace Stuart became an arthritic many years before the discovery of cortisone and many other drugs which, even if they do not cure, alleviate rheumatoid arthritis. I belong to a more fortunate generation blessed by modern science and the National Health Service. I have had many drugs during my treatment - cortisone, aspirin, and chloroquin, for example. Sometimes there have been undesirable side-effects; sometimes not. I have now arrived at a daily dosage which seems satisfactorily well-balanced, and as a result, although not freeing me to any very great extent from the effect of set joints restricting bodily activity, I rarely have much pain, other than as a result of foolish over-exertion. Personally, I've never seriously considered old-fashioned "folk" cures, though I have on occasions gulped down some laboriously concocted, intensely foul brew out of sheer curiosity. I do, however, always read accounts of "miracle" cures with fascination, and I especially enjoy reading those accounts of cures which appear in very old books. Not long ago I found, in an old book called Enquire Within Upon Everything (1869) an amusing treatment gloriously entitled "Colonel Birch's Receipt for rheumatic gout or acute rheumatism, commonly called the CHELSEA PENSIONER". The "Receipt", consisting of such tasty ingredients as nitre, sulphur, and mustard, reads more like gunpowder than medicine. Consult Me (1866) has some very revolutionary cures to offer: "Rheumatism: To cure, use the cold bath with rubbing and sweating. Or, apply warm steams. Or, rub in warm treacle, and apply to the part brown paper smeared therewith; change it in twelve hours. Or, drink half a pint of tar-water morning and evening. Or, steep six or seven cloves of garlic in half a pint of white wine: drink it lying down. It sweats, and frequently cures at once." Would that a cure were as simple (even if as distasteful) as that! Unfortunately, for the vast majority of sufferers in whom the disease will not "burn itself out" there is a whole new way of life to be learnt. Modern drugs can alleviate the physical suffering; the mental hurt can, with help, be adjusted to. One can learn to live with the minding. But how much better if there were no problems, if the disease were not there at all. Roll on the day when that wish comes true! In 1969 Jill wrote a script about her genealogical research, many years before the arrival of the Internet, and read it on the BBC radio programme 'Woman's Hour'. She recorded the script on 21 October 1969 and it was broadcast in about June 1970. This is a transcript of the BBC's heavily-edited version of the script, with Jill's handwritten amendments incorporated. Someone had told me that my mother's family came over from France in the French Revolution. And that set my imagination working. Maybe there was hidden treasure somewhere waiting to be collected. So I quickly appointed myself the family genealogist. First I made a rough plan of the family tree from what I already knew, from my grandparents and from other relatives who'd sometimes let slip a useful piece of information. Already there were interesting stories  about the aunt who married a Spanish doctor and presented us with  alas no castles  but literally scores of cousins in Spain, including a jolly Spanish TV weatherman. I discovered that one great grandfather had begun work in a Bradford mill when he was only 9½ years old. He actually retired once, at sixty-four, but soon afterwards started out in business again. At eighty-four he was President of the Bradford Textile Society, and in fact he went on working until he was ninety-two! Anyway I armed myself with a few dates and went off to try my luck at Somerset House. What a fascinating place it is! Full of people: earnest professional genealogists, and short-sighted, little old ladies. I filled in a form and then started searching through the massive indexes. But for just a few shillings, you can apply for a certificate which gives you quite a lot of information. There was great excitement when I received the certificates, which were full of names and ages and professions  professions galore: dentists, schoolteachers, shirt-manufacturers, journalists, actresses, doctors, textile manufacturers, weavers, iron-workers, organists and so on. I also learnt more about Joshua, a great-great-grandfather who'd owned a successful Yorkshire pub in the nineteenth century. A distant relative gave me a superb photograph of Joshua, taken about 1870. He's standing outside his pub, surrounded by some of his thirteen offspring. One of them was a pork-butcher named Harry. He was quite a gay dog, and he caused something of a family revolution by suddenly deciding he wanted to go to America to make his fortune. He borrowed money from everyone, and did, in time, make quite a lot of money for himself. But the irate family  most of the other twelve offspring  had to follow him to America to get their loans back! but I wasn't quite so lucky. cotton-reeler, hackle-maker, violin-player, paper-maker. I found one boy of eleven who was a coal miner, and an errand-boy aged seven, and many a lonely old person described merely as a pauper. Through my relatives and through official sources I soon had over one hundred annotated cards, one for each relative, and each with a signature, and sometimes a photograph. I also have several interesting birth, death and marriage certificates, and an impressive looking family tree. But the search continues. I haven't found great riches or titles yet, but I've had great fun. For a fee of course, I could have left all the research to the professionals, but I'm glad I didn't. I'd have got the information  but probably not quite as extensive, and certainly without all the thrills and excitement of the chase, and the satisfaction of a very rewarding hobby. This essay was written by Jill and published in the Summer 1983 edition of 'In Contact', the magazine for the Under 35s Group of Arthritis Care. My Hobby? Being a Gourmet! Just before Christmas I got a letter: "Many congratulations! You are one of our 25 readers to reach stage 2 of the Standard Great Gourmet Contest sponsored by Mouton Cadet." Fortunately, we didn't have to do any cooking ourselves. For the semi-final we just had to sit back, eat, drink and enjoy it  and then answer questions on the food. First came a fish dish, which we had to identify together with two sauces. It turned out to be fillets of smoked eel, which I ate and enjoyed, but I don't think I'd have enjoyed them quite so much if I'd known beforehand what I was eating! One of the sauces was horseradish (easy), the other was a green sauce and I could NOT work out what made it green! Apparently it was chives, sorrel, chervil, spinach, watercress and parsley. The next dish was one I'd anticipated, knowing the sort of food Rules is famous for. It was grouse, steak and kidney pie, and this time I got the ingredients right, together with the swede purée. A side salad completely foxed me  apart from celeriac and green pepper. It apparently also contained beetroot, endive and fennel. Nor could I work out what in the salad dressing made it different from mayonnaise  apparently it not only uses raw egg yolk but hard-boiled yolk as well! Next came a trifle. What was the alcoholic ingredient? Mandarine Napoleon Brandy. NOT very traditionally British, thought I, grieved at not having got that one, though I could say what the French and Italians call trifle  'English Soup'! But we still hadn't finished. Next, in true Edwardian tradition, we had a savoury. Toast spread with haddock purée, garnished with a mushroom. What was the connection with Sir Walter Scott? I wrote down the only relevant novel title I could think of, 'Ivanhoe', and was tickled pink to learn that the savoury was indeed called 'Canapé Ivanhoe'! Despite that brilliance, I didn't get anywhere near the possible total of 35 marks. Five people got through to the final, which will be held in Chateau Mouton Rothschild in Bordeaux, in April. Lucky people! Never mind. I did get two lovely bottles of wine as consolation. Shall I enter again next year? Yes, I think so. It's certainly the most enjoyable competition I've ever tried to win, and what with Langan's one year and Rules the next, I'm getting a real taste for the high life at someone else's expense! This essay was written by Jill and published in the Autumn 1985 edition of 'In Contact', the magazine for the Under 35s Group of Arthritis Care. Could I Really Learn To Fly? The first time I flew as a passenger I was only 18 months old; I wish I could remember what must have been a magical journey. We flew from England to Kenya by flying boat on a leisurely journey with overnight stops in exotic places like Malta and Sardinia, before finally landing on beautiful Lake Naivasha in Kenya, under a blazing tropical sun. We lived in East Africa for the next nine years or so, flying there and back several times, and I adored it. Never did I dream though that I might one day have the chance to fly a plane myself, and that seemed ruled out forever then the old R.A. struck at the age of 10, and I got more and more doddery. But, here I was, in April 1985, at RAF Biggin Hill, undergoing the same selection tests (over a 48 hour period) as prospective jet fighter pilots for the RAF! I and 19 other registered young disabled people (aged between 17 and 40) were on a shortlist of hopefuls (from an original 99) trying for up to six flying scholarships. These were inaugurated by the organisation of the International Air Tattoo, in memory of Sir Douglas Bader, who died in 1982. The scholarship would be for a course of approximately 37 days at an appointed CAA approved flying school. The first six were awarded in 1983 and most of those winners now have their PPL. 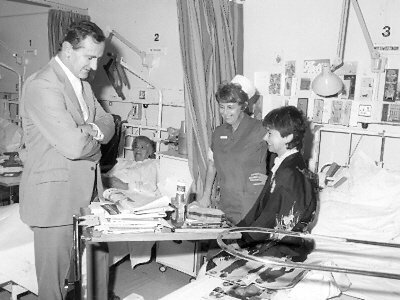 By 31 January 1985 we had to submit a detailed application form, giving full background details, medical history (including a question "How have you overcome this disability? "), and an essay (up to 1000 words) on "Why you wish to be considered for a Douglas Bader Scholarship and why you would like to learn to fly". The Rules and Conditions of Entry included "Candidates must be able to communicate easily, hear and understand written and verbal instruction. He/she must also have enough mobility to get in and out of a standard Cessna 150 or Chipmunk training aircraft unaided and be able to operate all the flying controls and aircraft systems safely." I wasn't at all sure about getting in and out of a plane unaided, but my brother (who's a pilot) thought I ought to manage OK. My boyfriend persuaded me to to go to a local flying school where they very kindly let me work out how to clamber in and out of a Cessna. It felt wonderful! I must say, you had to be fairly fit and agile simply to get around at Biggin Hill. The Mess (where we had all our meals) was up a flight of stairs, and it was quite a walk from the barracks to the Mess and then to other buildings for various tests. That apart, we were looked after terribly well and fed well too! We all met at lunchtime on the Wednesday  a very jolly crowd. One was just about to take 'A' levels, and another was a helicopter crew disabled in action in the Falklands. All sorts of backgrounds and interests, but all passionately keen to get the most out of life despite disability, and all very eager to learn to fly! That afternoon we plunged straight in to very thorough medicals  body measurements, blood and urine tests, sight and hearing tests, blood pressure, detailed examination of medical history, etc. We all felt we'd earned our dinner that evening and the drinks afterwards in the well-stocked bar! No time for idleness on Thursday. The alarm went at 0630 and by 0820 we were already sitting at desks in an examination hall, ready to plunge into the first of many against-the-clock aptitude tests. Some were great fun, but I was horrified by the advanced trigonometry and algebra  most definitely my downfall. The coordination tests were great fun  in one you had to use a rudder and stick to centre an errant dot of light on a screen. In the afternoon we had interviews. Pretty solid grilling about all sorts of things, from how you would find your way in a small aircraft to discussions on current affairs. Needless to say, after such an exhausting day the bar was again extremely well patronised in the evening! The final day, a third of us were weeded out. Including me, alas, but I was invited to apply again the next time round if I felt like it so I can't have been totally dreadful! Maybe I'll try again if I can first cram in a mathematics degree? The selection board whittled the remainder down to just six scholarship winners (four men, two women, and mostly amputees). We all received extremely nice letters not only thanking us for attending, but also enclosing a 'consolation prize' of four complimentary tickets for the fabulous International Air Tattoo at RAF Fairford in July! I must say, although I didn't win, it was a superb (if taxing!) experience and all the people I met were tremendous (competitors and RAF people). Everyone deserved to win, so I was really delighted for those who did. Here's a challenge to you. Which Under 35 member will be the first to win a Sir Douglas Bader Flying Scholarship? This essay was dated 20th October 1985 and written by Jill for the Under 35s Group of Arthritis Care. I developed juvenile chronic arthritis at the age of 10. It has been inactive since I was about 22 or 23, but left me with damage in most joints, including severely damaged hip joints. I had bilateral total hip replacements in 1976 (aged 27), with a revision in 1983 and (possibly) another in 1985. I also have a very painful ankle. In 1985 I was diagnosed as having scleroderma with Raynaud's phenomenon. Both education and work are extremely important to me. It seems imperative that where the body is incapacitated, as much attention as possible should be paid to the health of the mind, and mental activity. To be able to work is essential for my own self-respect, essential for financial reasons, essential for my health (while I work I can forget pain and disability problems), and important in that it is one area where my abilities rather than disabilities are emphasised (unlike for instance housekeeping and childrearing where the emphasis would be so much on physical input which would only emphasise my inabilities). I am very thankful I was not made to go to a special school or institution during my school years. Attending a normal school was a struggle, but apart from missing the first half-term (when the illness was first diagnosed), I managed to continue with minimal absence. I did not play games, and had other small concessions such as not having to go out at playtime. I was not very happy, but I was able to concentrate on schoolwork, and fortunately very successfully. Had I not gone to an ordinary school I doubt whether I could have achieved the ten 'O' levels (three at grade 1, none below grade 3) and three 'A' levels (two grade B, one grade A) which I obtained. I was lucky to get to University. I had to have a room on campus. I studied modern languages, and had to spend a year abroad, which caused me great trepidation. Fortunately after initially unsuitable lodgings a long walk from the campus (Tours, France), I managed to get a room on campus. 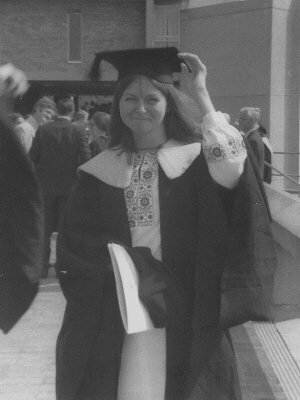 I eventually graduated with BA (hons) French and German (2:2), in 1971. Getting a job seemed to take a very long time, and doubts were expressed at interviews as to whether I could cope. 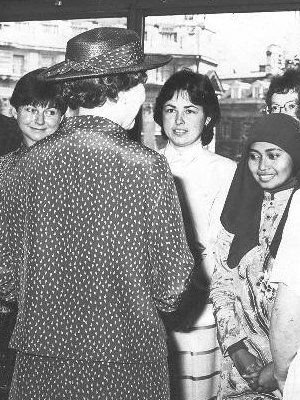 Fortunately, one organisation was willing to give me a chance, and I started in August 1971 with the British Council, where I did administrative work (mainly but not entirely desk-bound) arranging tours overseas by British specialists. Because of my RA, the Council would not offer me an indefinite contract with pension rights. They would accept me only for one year's fixed contract. I hoped this would be reviewed if my performance for that year was successful, and in fact took not one single day's sick leave during that year. I was therefore horrified that at the end of the year all I was offered was another year's fixed contract (and no pension rights). 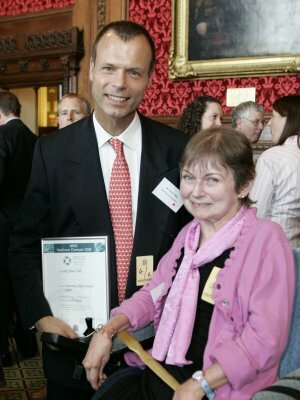 I felt it was particularly unjust (a) because I had proved I did not take sick leave and (b) because it was obvious that the medical and specialised differences between juvenile RA and that in older people had not been taken into account, in particular the findings that some 70% of children with arthritis do recover with little residual damage. My medical history strongly indicated that I was amongst that 70%, and my rheumatology consultant wrote a strong letter in support of my case. We did after a while get the decision reversed, much to my relief, and I have since then been on an indefinite contract with pension rights. Unfortunately my hip joints were more damaged than I had realised, and got worse and worse, so that I did have to have periods of sick leave for hip operations (two in 1976, one in 1983). But apart from the operations it has been a point of pride for me to take almost no sick leave otherwise. Admittedly it is a help that the disease itself is no longer active, but it is sometimes a struggle, nevertheless, to face going in to work day in, day out. I have only this year, 1985, registered as disabled, as before I felt to be registered would have made things more difficult for me rather than less. In April 1985 the British Council became an Equal Opportunities employer and this gave me more confidence to register. Other illness-related problems have arisen in different ways in the Council. When I applied for a transfer to another department, at my interview I was asked 'Can you write?'  which I found insulting given my extremely good academic record from which it was obvious that if I did have difficulties writing, I'd found ways of overcoming them: I've found that some people tend to see me as only a 'one-dimensional' disability; they can't see that I do things for a million and one reasons, like everyone else. They think if I question something, it must be because I'm in pain or having a bad day, rather than accepting there might be sound reasoning behind my questions. My unwillingness at present to transfer departments was at once put down to 'health reasons' when in fact I have a very strong case for staying put completely unrelated to 'health reasons'. If I use my illness/disability as the reason for staying put I am merely reinforcing the view that sees me only as a 'one-dimensional' disability. Physically, coping with work, is not always easy. The main difficulty now is with the journey to and from work. With my very vulnerable hip joints and very painful ankle it has been a real struggle. I have had to go on the tube, because of the expense. I have just recently applied for Mobility Allowance, and very much hope I can get it, though am pessimistic. It would be helpful if 'In Contact' would show different people's experience of applying for the Allowance. My left hip joint broke loose at the end of August 1985, and after two weeks of pain, it was sufficiently under control for me to try to get back to work. This was important (a) to keep my mind occupied (b) for financial reasons - especially my mortgage and (c) because of the limits on sick leave allowed by the Council. I was fortunate to hear about the GLC taxicard scheme, which I can use although I don't get Mobility Allowance. This is a wonderful scheme and without it I could not have gone back to work. Once at work I have been using an electric battery powered 'Scoota' for getting around (the building has many adaptations for wheelchair bound people, though is not wholly perfect). The Council allows up to six months certificated sick leave on full pay in any twelve months, and a further six on half pay, but this is subject to a total limit of 365 days in any four year period. I had to have four months off in 1983, and it looks as if 1985 will register at least four months, maybe five. This allows me very little leeway now if I fall ill again before mid 1987, and this is a possibility given my recently diagnosed systemic sclerosis and my painful ankle. My mortgage and I will nervously have to keep our fingers crossed. The first doctor I saw with my aches and pains, when I was ten, diagnosed and treated me for flat feet. When that didn't help, he said the arches were too high. It wasn't until an agonising year later that I found another doctor who made a correct diagnosis, and then backed it up with effective treatment and support. The hip op is wonderful, but I do want you to know the facts. My medical team were very careful to make me aware of the drawbacks before I had my ops. For me they really were a last resort, and I went in 'with my eyes open' (figuratively speaking!). Though they were likely to be successful, there could still be problems, but I knew none of those problems could put me in a worse position than I was. Anything had to be better than that pre-op hell. Bedroom: Bed at right height (on blocks). Firm mattress. Light but warm duvet. Electric blanket or hot-water bottle. Reachable light switch and well-positioned light. Bedside table for books, radio, drink/vacuum flask, alarm clock. Phone accessible from bed. Longreach gadget hanging by bed. Though the TV's not directly in view, I can actually watch and work it by remote control by bouncing the control's rays off a carefully-angled mirror! Published in 'Arthritis News', Summer 1992. When Jill Holroyd couldn't find the book she really wanted to read, she wrote it. ARTHRITIS. It's the biggest single cause of physical disability in the UK. It also appears to be the biggest single cause of health books. Because the disease is prevalent yet not fully understood, the demand for more information seems insatiable - from medical textbooks on any of its 200 or so forms to paperbacks promoting treatments and 'cures' of every type imaginable and more besides. What is perhaps surprising given the sheer volume of volumes is how few are written by people with arthritis. It's a thought that struck Jill Holroyd too. "You go through a stage when you're craving for information. You go to the library and the books are either very medical or very subjective. Finding out what the synovial membrane does in RA is interesting but it doesn't help you make a cup of tea." With her new book, Arthritis At Your Age?, Jill's set out to fill that gap. "It's a book I hoped someone else would write. No one did and I had some spare time so I started it myself." In the end it took five years research to produce. Arthritis At Your Age? combines a friend's chattiness with the authority of a well-sourced academic work. It is very readable and, at 300 pages, is a genuine attempt to be comprehensive. Jill, who works full-time for the British Council, has been a member of Young Arthritis Care and its forerunners for more than 15 years including spells as magazine editor and in the chair. The book is aimed at people in their late teens to early 50s. "It's for people like me," she says. "People don't realise how different arthritis can be when you're young. The more complicated types start in young people and it's all the more difficult because it's so unexpected. "Your 20s are stressful times anyway with finding a job, somewhere to live, forming relationships but at least everyone else is doing those things too. Suddenly, arthritis is very frightening and isolating and something your friends aren't sharing. "I wanted this to be a friendly book because young people can go for years not meeting others in the same position and, however understanding your family are, the fact is they are not experiencing it." At a time when every new diet, exercise routine or treatment seems to find its way into print, it is incredible that Jill has had to set up her own publishing house to bring the book out. "I tried quite a few publishers. They said it was good but not commercially viable." But there are more than a million people under 45 with arthritis? "Publishers just don't realise how many people are affected or how difficult it is to get good information. Medical books always talk about a progressive disease so you can think it's going to be all downhill. "I wanted to strike a balance. Of course, there have been downs for me in the last 30 years but there have been ups too. This is a consumers' guide which people can dip into and mix and match to suit their own requirements." Jill was disheartened by the publishers' negative attitude but she also knew they were wrong. "I knew there was tremendous need. Many times I thought about throwing it all in the bin but other young people with arthritis encouraged me to keep on." The book is full of real quotes from such people about their real-life experiences. To share them with others, Jill raided what she calls her Learning To Drive Fund. "It means I won't be able to drive in the near future although eventually I hope to recoup costs," she says. Jill has set up the Grindle Press, named after a river in Suffolk, to launch Arthritis At Your Age?. She typed it all herself and tracked down a printer who could turn her word-processor discs into pages for printing. Photos were commissioned from a professional photographer with arthritis. Touches like this and the ingenious wire binding which allows the book to be laid flat, would probably not have occurred to a commercial publisher or would have been considered unimportant. In this respect, self-publishing is a strength and the professional standards Jill applied are every bit as exacting as those of a commercial publishing house. Research is her keen interest. She's traced her own ancestors back to the mid-eighteenth century. In the 1800s, hers was a family of molecatchers which is presumably why Jill has so successfully burrowed through the mountain of material she needed to study for her book. Arthritis At Your Age? includes basic medical information and discusses psychological and emotional issues alongside more practical matters such as housing, money, shopping and employment. "I learnt a tremendous amount myself from doing this. And about myself. The most challenging was dealing with the emotional side which has not been tackled before." Jill says she also learnt a lot from the process of self-publishing. Producing a book is an exhausting and time consuming business particularly alongside a full-time day job and when punctuated with hospital visits and operations. She intends to donate any profits to appropriate charities. The book's quality suggests that the publishers' loss may yet be the charities' gain. Jill reckons that one of her forefathers was a highwayman. At £7.95, the book is far from highway robbery.  Arthritis At Your Age? by Jill Holroyd (Grindle Press; 1992) is available direct from the publishers at £7.95 plus £1.65 p&p (p&p reduced for 5-9 copies and free on 10 or more). There is also limited availability through book sellers at £9.95. Written by Cathy Bown and published in the East Anglian Daily Times, 5th October 1992. 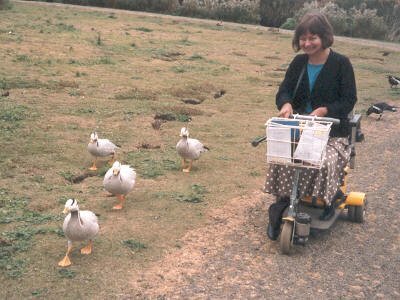 The article was illustrated with the photograph of Jill at Peakirk Wildfowl Trust, Cambridgeshire, which is shown near the top of this page. Arthritis at your age? That is a question Jill Holroyd is used to hearing  so she has chosen it as the title of her book. Jill, now 43, developed juvenile chronic arthritis at the age of ten. Her book is intended for the one million or so people, men and women, under 60 who have a rheumatic disorder. "Ever since my own diagnosis, I wished there was a book about young people with arthritis, a book which understands what it is like to have arthritis when you are young," explained Jill, who divides her time between homes in London and Chelmondiston. "People associate it with elderly people and the type of arthritis that affects older people, which is usually limited to joints. "More complicated types tend to start in younger people. They do have very wide ranging impact on people's lives, at a time when all sorts of things are happening anyway: having a family, looking for a job, somewhere to live. "It has a tremendous impact on all those. Normally you can talk about these things. Having arthritis is something you don't share with other people. You need a lot of help with dealing with it, overcoming isolation." Jill says that a few years ago she joined a group and met other younger people with arthritis. They all agreed that there was a need for information: "A need for younger people with arthritis to feel that there are other people who share the same things, that there are ways of dealing with the problems that come up." Jill says her own illness began when her family was living in Africa. The doctors there hadn't seen arthritis in a young person before and didn't realise what it was. It wasn't until they came back to England a year later that Jill's illness was properly diagnosed. "By then I was in a pretty dreadful state. I could hardly move and I was in great pain. Having it myself has helped me understand what worries other people," she said. Her book is by no means limited to her own viewpoint, however. She quotes extensively the experiences and ideas of many other people with similar problems. Jill always hoped that someone else would write the book, but when she realised no-one would, she decided to do it herself. "I got down to it about five years ago. Since then I have spent most of my spare time researching it and putting it together. "I was considerably helped when I got a word processor. I certainly couldn't have done it without that. It was typeset from own discs. That reduced production costs." Jill has published the book herself, setting up the Grindle Press (named after the stream at Pin Mill  her boyfriend Andy is a keen sailor there). She tried to find a commercial publisher and was told that the book was good but not commercially viable. "I don't think people realise how much demand there is for a book specifically dealing with arthritis in younger people, how much need there is for it," she said. It is selling well, and already copies have been exported all over Europe and as far afield as Lithuania. Jill insisted on a special binding which means the book opens flat to help readers with weak hands. Jill works for the British Council in London doing editorial and computing work. She has been there "about 20 years" and enjoys meeting people from overseas. Her family moved to Suffolk about 12 years ago. "I spend as much time as possible up there. My parents have retired up there." Jill's parents, Ken and Brenda Holroyd, are both on the committee of the East Bergholt branch of the Arthritis and Rheumatism Council, and her father is chairman of the fund-raising committee. Her parents have also played a key role in distributing the book, since Jill has had to spend the last few weeks in hospital in London. Already hundreds of copies have been sold and the book has been enthusiastically reviewed in publications for both patients and their doctors. "Rheumatologists and other health care professionals who have seen it have been very complimentary, very enthusiastic about it," Jill said. She admits it has been a struggle, "trying to get the book out and coping with my health problems." "Normally I am not too bad," she says, cheerfully. "I have had four hip replacements and an ankle fusion. They are the only times I have been in hospital. "I have had two hip dislocations and a cardiac arrest  they tried a drug that my body didn't like. Now I have got an ankle ulcer. It is not the best of circumstances for getting the book out." One thing that has cheered her up in hospital is thanks from readers. "There is quite a bit of response already. It has been great. That is the nicest thing about it, having letters back from people saying: 'It is just what we were waiting for'. "Somebody said: 'it reaches the parts other books don't reach', which I thought was a lovely compliment." Jill sent a copy to author Marie Joseph. "I read her autobiography many years ago. I thought it was wonderful. 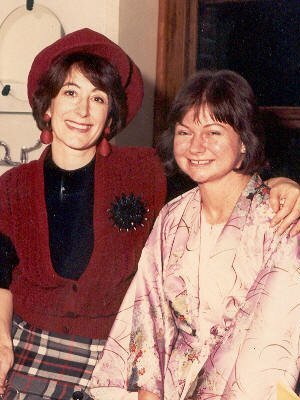 She developed rheumatoid arthritis in her 20s, and is now 72 and a grandmother She was very enthusiastic about the book. She said she wished it had been available when her RA started." But Jill has no immediate plans to write another book. "I think I have had enough with the one. It took up so much time and energy." She is "reading non-arthritic books" for a change, and has started some tapestry. Jill says she does not feel resentful about her illness. "There are opportunities I feel I have missed because of it. It has been a question of making the most of what I can do rather than getting depressed about what I can't do.  Arthritis at Your Age? by Jill Holroyd is published by Grindle Press at £7.95 plus £1.65 P&P. Written by Elizabeth Hall MCSP and published in 'Physiotherapy', April 1993. 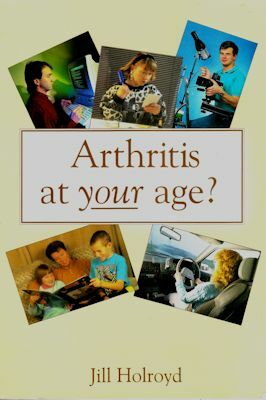 An arthritis sufferer herself from a young age has written this book to provide a wealth of information for other young (under-65) arthritis patients. The book begins by discussing some of the different rheumatic conditions and the various treatments available. The rest of the book is devoted to all aspects related to 'living with arthritis' - i.e. employment, further education, socialising, holidays, relationships, marriage, etc.
' rather than thoughts and ideas written by non-arthritic people who can only imagine what it must be like to have arthritis. The overall bias of this book is that patients need a good working relationship with their healthcare team and that they are the people who are central to that team and they need to find out how to help themselves using medical professionals as advisers. At the end of each section there is a bibliography and list of useful contact numbers and addresses. I feel that the right balance has been achieved in expressing the more depressing aspects of these potentially very disabling diseases and the endless possibilities for leading a fulfilled life provided patients have a strong will and good support from others. Though primarily written for patients, this book is an invaluable source of information for anyone involved in the management of people with arthritis. The layout makes it easy to dip into and use, as intended, as a reference book. The ring binding instead of a traditional solid spine makes handling the book much easier; especially for arthritics who often have poor hand function. Overall I would say it is excellent value for money and a must for all departments including physiotherapy, occupational therapy, and the wards, as it provides quick and easy access to information for patients and their relatives as well as members of staff. Letter from Jill to The Times, published on 6 November 1993. Sir, Brian Mawhinney, the health minister, asserts (letter, October 28) that London hospitals benefit at the nation's expense: "London currently receives 20 per cent of the NHS budget for 15 per cent of the population." This may be so, but then London's hospitals treat 17.5 per cent of the NHS caseload and train 30 per cent of medical students. In a year they generate more than £1 billion for the economy by training overseas doctors and treating foreign patients. Letter dated 8 May 1997 from Jill to Dr. Mike Shipley. I am writing to thank you so very much for the tremendous help you and your team gave me during my recent emergency admission for colorectal surgery. A nightmare loomed - prolonged immobilization/danger of pressure sores and other complications/indefinite postponement of discharge date, etc. Then you came to my rescue - thank you so much for coming so quickly and for referring me to your wonderful senior physiotherapist, Iain Hopkin. It is all thanks to Iain Hopkin's specialist rheumatoid arthritis expertise and uniquely vast and sensitive experience with RA patients, that I am home again already, and getting around inside, albeit slowly, on crutches. The right thigh is still troublesome, but I am continuing to work on the exercises and advice given by Iain. I am immensely grateful too, to the other members of your team who looked after me with such reassuring expertise and great kindness. THANK YOU. Letter dated 19 April 2000 from Jill to Dr. Mike Shipley, Consultant Rheumatologist. I am sorry this letter is so late in coming to you, but it is no less sincere, despite the delay. I am so immensely grateful to you, Dr. Shipley, for the speed and sensitivity with which you rescued me in my two recent 'crises' - first, the DVT you found in my leg when I visited you on 1 December, and second, in March, when I was on Bland Sutton, and struggling to recover from my ileostomy problems and operation. It was a shock to find I had the DVT, but such a relief to be in your care and to know all would be well. Thank you, tremendously: I dread to think what would have happened had you not rescued me. It was such a relief, too, when you came to my rescue after the ileostomy operation - first, in sorting out instantly the pain control problem which seemed to have been going on for ages, and second, in so kindly agreeing to take over my care on Jackson Burrows, when I was having such a difficult time trying to regain sufficient strength to get home again. Hilary Lawrence, the physiotherapist on Jackson Burrows, was wonderful, and understood exactly how to help 'get me going' again. Being on Jackson Burrows meant I was able to have much more of the appropriate help than was possible on Bland Sutton. Before, I had been feeling extremely worried and pessimistic about my mobility and ability to get home. It was wonderful to be welcomed back into the 'Jackson Burrows family' again, under the care of many staff who already knew me and my various RA (and other) needs and eccentricities, especially Ninette, of course, who is always so thoughtful and kind and understanding, and likewise Senior Staff Nurse Becky Ridge. All in all it made all the difference being able at that stage to be transferred to the care of you and your team. It not only boosted my morale and strength, but eased and speeded up what had been proving to be an extremely difficult period of recuperation. This essay was Jill's entry for the EULAR [European League against Rheumatism] Edgar Stene Essay Prize 2007. The prize is awarded to a person with arthritis or another musculoskeletal condition for the winning essay based on their experiences. The theme of the 2007 competition was 'The Small Things in Life Matter'. to what? To the unexpected. To nasty shocks. To sadness, to cruelty, to happiness, to kindness. To occasional joys. To obstacles and challenges. To solutions and triumphs. A tiny message from my 10 year old body signals the start of a grim war. My feet splay out when I walk. Legs feel heavy and achy after playing in the garden. A tiny message from my 36 year old body signals a second war. A tiny red finger ulcer screams with pain and refuses to go away. Fingers blanch or go blue with stress or a temperature change. Later tiny spots appear on my face. What can you do when your young dreams are shattered? When your joints become powerless and bones become gnarled. When you're depressed and exhausted and wish you could die. You learn, eventually, that big oaks from little acorns grow. That if I try to help myself I'll feel better and others will learn how to help me too. I'll give the medications a fair try and listen to the doctor and the physio. If I keep busy with school and work and hobbies the pain won't control me so much. Some people around me will try to understand - I'll focus on them and try to ignore those who won't. Try, and keep trying. Now, at this end of life, I look back at the big battles in these wars. The six hip replacement and revision operations, the ankle arthrodesis, the major pelvic reconstructions, the girdlestone, the full leg amputation. And the pain. And more pain. And yet more unbearable pain. In the second war: the medication-induced tachycardiac crisis, the cardiac arrest, the many vicious chronic infections, the sudden uncontrollable diarrhoea then colon removal and ileostomy. And the frustrations and miseries and inability to control so much of my life. But then, yes, it is so often the seemingly small things that have kept me going while the battles rage. Kindness especially - the gentle kindness of an overworked nurse, the doctor who treats me as an intelligent and sensitive human being and who writes on the X-ray form 'treat Miss H gently - her bones are very fragile', the kindness and caring smile of the lofty and very learned surgeon. The employer who focuses on my talents and skills, and is rewarded in return by an ever-loyal hard-worker. Family and friends who treat me as a person not as a 'condition', and those who help repair my battered self-esteem. People, too, who allow me to do things for them. Who allow me to feel needed, and useful, not just a pathetic passive object of pity but a contributor to a tiny bit of the world. Small physical things too can help loosen the chains that lock me within a stubborn uncooperative body. Seat, bed, kitchen and bathroom equipment - all at the right height and doing what I need them to do. Gadgets to prepare and eat food and drink, to pull on socks and stockings and put on clothes, gadgets to help me keep clean and smell sweet, gadgets to reach what's too high and what's too low, nifty tricks so I can get about OK - could even drive my own car. Trivial matters to others - sanity-savers to me. And - I nearly forgot - two of the smallest 20th century discoveries with some of the greatest impacts on winning my wars. First, of course, thanks to Alexander Fleming and his successors - the tiny but miraculous antibiotic. Without the antibiotic family I'd definitely have lost the wars long ago. Second, from designing techniques and materials for hip implants and for surgery and medicine generally, to the computers I've used at work and at home, and all that wonderful remote-controlled wizardry that expands the limited horizons of my life. - How could I overlook it? The miraculous microchip! Yes, the small things in life do matter, definitely. 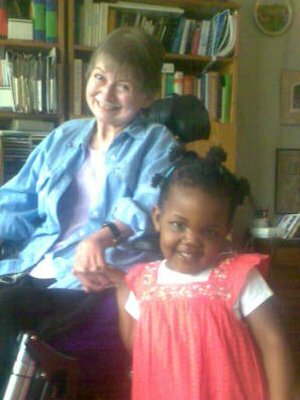 Jill Holroyd was 10, and living with her family in Tanzania, East Africa, when the first symptoms of chronic JIA appeared, although it was not diagnosed correctly until an agonising year later, after they returned to Britain. In Jill's mid-30s, severe finger ulcers signalled the arrival of Raynaud's phenomenon with systemic sclerosis and Sjögren's syndrome. Jill's first hip replacements were in the 1970s, at the age of 27. 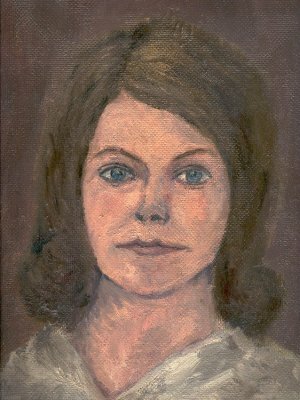 Her operations have included six hip replacements/revisions, a girdlestone, bilateral pelvic reconstruction, an ankle arthrodesis, a proctocolectomy (plus ileostomy), thyroiditis and a leg amputation. Jill also has an honours degree in modern languages, and worked full-time for over 22 years for the British Council, in editorial, administrative, and management consultancy posts. In 1992 her book 'Arthritis at your age?' ('a friendly handbook for young and youngish adults with a rheumatic disorder') was published. It is now being updated as an internet book. 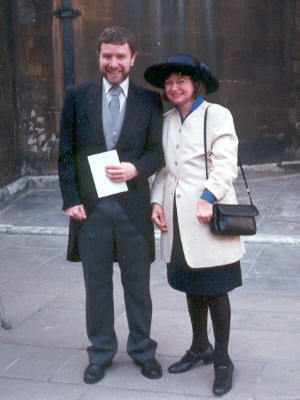 Since the end of a 14-year relationship, Jill has continued to live independently, and busily, in London. This is Jill's successful nomination of Mr Johan Witt, Consultant Orthopaedic and Trauma Surgeon specialising in Pelvic, Hip and Knee Surgery, for one of the National Rheumatoid Arthritis Society's Healthcare Champions Awards. These Awards were presented in the Strangers' Dining Room of the House of Commons on 4th June 2008. Mr Witt is a wonderful, wonderful man. I was diagnosed with Juvenile Idiopathic Arthritis many years ago at the age of 10. My first two hip replacements were in 1976, aged 27. Extensive joint damage led to several hip replacement operations, until in 1995, at the age of 46, my right hip completely collapsed. Much of my pelvis had worn away, I couldn't get out of bed, and the future was bleak. But then Mr Witt appeared. He saved my life. I was one of his first patients after his appointment as Consultant. In a highly complicated eight-hour operation he reconstructed my pelvis, using donor bone grafts and metal, and he inserted a new hip joint, so I was able to walk again. The following year he did the same on my other side, and has performed other operations on me since then. Mr Witt is not only highly qualified and highly skilled, but also a wonderfully kind and approachable person, a priceless combination for those of us who have spent most of our lives struggling to live in a body attacked by JIA. Born 8 October 1948 in Bradford, Yorkshire. Died 19 August 2009 in University College Hospital, London. 1951 to 1953: Red House School, Nakuru, Kenya. January to March 1954: Wibsey Primary School, Bradford, Yorkshire. March 1954 to March 1955: Otley Road Primary School, Shipley, Yorkshire. March 1955 to July 1959: Government European School, Dar es Salaam, Tanganyika. September 1959 to December 1966: Croham Hurst School, South Croydon, Surrey. 1967 to 1971: University of Kent at Canterbury, including the academic year 1969 to 1970 at the University of Tours, France and one month in summer 1970 at the University of Heidelberg, Germany. Graduated with B.A. with Honours in French and German. 1971 to 1993: British Council. Specialist Tours Department, Service Conditions Department, Education and Science Division, Medical Information Service, and others. 1992: 'Arthritis at your age?' published. Love living here (over 30 years). Enthusiastic about LINk - Keen to contribute my skills and experiences constructively: editorial, writing, information, management consultancy, etc from my British Council career. Wide-ranging experience of ups and downs in health and social care, having lived and worked with several long-term conditions since age ten. Widely travelled. Current voluntary work includes CoL's Access Group, Homecare Users' Group, Barts and UCLH NHS Trusts, National Rheumatoid Arthritis Society, monitor Guildhall meetings from service user viewpoint. Author of 'Arthritis at Your Age?' - "excellent book: positive, constructive and packed with information" (British Journal of Occupational Therapy).